News: John's race report and the Auckland ITU update, IM South Africa & Hits Napa Valley are coming up. This Weeks Discussion: Bevan finally gets his question on for this weeks discussion. What is the one thing you don’t do that you know you should to get faster? This is the best question ever ;-) Comment here. This Weeks Photo: Here's a photo of the boys in the IMTalk studios. Age Grouper of the Week: Ken Young sent through Vaughan Hunt for this weeks Age Grouper. Vanghan had a crash in IMNZ but still managed to finish the race. After the race he had an X-Ray which showed he had a compressoin fracture in his back. Well done Vaughan. 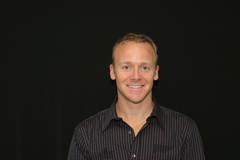 Interview: Paul Laursen leads the Performance Physiology Team at High Performance Sport New Zealand. On this weeks show he shares the lastest thinking on electrolyes and nutrition for Ironman. This is a great interview. Check out his profile on the AUT website. This Weeks Website: Swim Smooth website for training ideas.